The Just Right! remote collar training system gives you an easy to follow format to train your wayward pooch into a great dog! This 2 volume DVD set takes you through the basics of obedience training teaching Come, Loose lead walking, Sit, Down, and Place for your dog. Plus you will learn the tips needed to stop nuisance behavior like jumping up and barking. E-collar training gives you everything you need to safely enjoy your dog on and OFF leash! Each DVD is approximately 35 minutes in length and taught by Robin MacFarlane. Robin is a leading authority and a sought after professional for her her knowledge and expertise about remote collar training and applications. Learn more about Robin here. Each DVD can be purchased separately or save $5.00 by purchasing this 2 volume set. All of the dogs used in this video were strays or relinquished dogs to an Iowa shelter for behavioral reasons. After training, each was successfully adopted! This video contains several unedited video sequences so you can see a real progression and know what to expect when starting your dog on a remote collar. All dogs trained in this video were pets owned by clients of That’s My Dog! Inc/Robin MacFarlane. 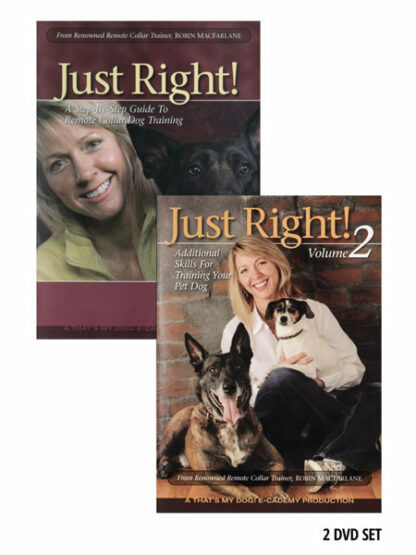 Each dog understood the basic skills as taught in Just Right 1 and progressed through these next training steps for production of Just Right 2.